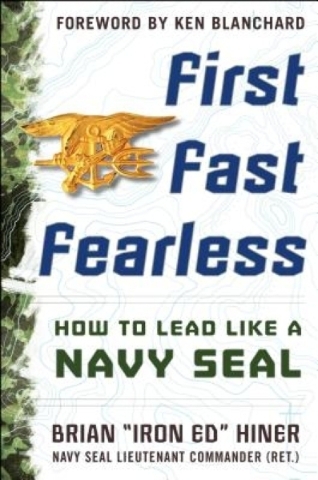 “First, Fast, Fearless: How to Lead Like a Navy SEAL” by Brian “Iron Ed” Hiner (McGraw Hill, $26). Brand deals with leadership style. The leader’s principles, values and outlook values are mirrored by their teams. Staff wants to trust and respect their leaders and expect to be trusted and respected. Choosing “We” over I, me and mine builds two-way trust and respect. A leader’s decisions made in the moment are subject to change as the situation dictates. Team engagement in the decision-making process makes adapting to change fluid and dynamic. Brotherhood extends beyond teamwork because it tears down silos. The phrase “all for one and one for all” means that there’s a “full commitment to look after each other and put the well-being of others before themselves.” In brotherhood, individuals take pride in their roles and create relationships that show appreciation for the talents, skills and perspectives of others. It’s the leader’s responsibility to show that people can excel as individuals while operating as a team. How? By ensuring they view the work of the team as a learning experience, which complements skill sets. While there are procedures teams should follow, Hiner points out that “you cannot move at the speed of war when you are caught up in the rules of bureaucracy.” The leader must also make it clear that there is no rule book for innovation, creativity and critical thinking — as long as they’re grounded in doing the right thing and supporting the mission. Brotherhood also involves continuous education. Leaders must develop talent. Brothers rely on everyone bringing their best to tasks. When the learning process for one stops, the ability to make progress for all stalls. “First, Fast, Fearless” embodies how to lead the front line. The farther you are away from the trenches, the greater your reliance on the front line to assess the situation and act. If they have to go through layers of bureaucracy and wait for direction, the original situation will have changed, and the execution won’t be successful. While there’s risk involved with delegation, it’s a valuable learning and developmental tool, and it shows confidence and trust. Hiner advocates MBWA (managing by walking around) as the way leaders stay in touch with the troops. It shows that they care enough about the situations with which the troops are dealing. They can take the pulse of the organization quickly as long as they’re willing to listen to input. Leaders can find out things they need to know. Key takeaway: As a leader, “Iron Ed” Hiner doesn’t have an “Iron Head.” He sought and valued input. He knows that a leader’s job requires constantly sharpening the tip of the team’s spear.